I have some awesome news to share with all of you: I am officially eating for three! That's right, I am expecting baby # 2! I am SO excited! But why do I say I'm eating for three and not two? No, I am not having twins. I am now 14 weeks pregnant and still nursing Daniel who will be 11 months old in 9 days! So I have to feed the baby growing in my womb, my avid little nursling, and myself and boy, am I hungry! A normal sized meal doesn't even begin to fill me up anymore. I am constantly hungry, even minutes after I finish eating! I wake up at 3 or 4 am absolutely starving! It's only normal as Daniel is still nursing 2 or 3 times overnight, a few times in the morning, at both his nap times (when he decides to nap) and right before bed time. He also has a bunch of less than a minute long nursing sessions throughout the day, he just latches on a for a few seconds and then is off to playing and exploring the world again.On top of all that, I am also feeding the new baby inside of me and still have to keep up with my own caloric and nutritional needs. How could I not be hungry then? Despite all of the hunger, I am excited to be on this journey to become a mother of two and, possibly, a tandem nursing mother! Many people have asked me if this is safe. I guess a lot of people are under the impression that you are not supposed to continue nursing while pregnant because it will cause a miscarriage or preterm labor. I have also heard that Daniel will take nutrients away from the fetus or that my milk is now "bad" and can hurt Daniel or give him diarrhea so I wanted to clear up some of these misunderstandings. First of all, it is perfectly safe to continue to breastfeed throughout your whole pregnancy provided that you have a normal, healthy pregnancy and I was cleared by my midwife to do so. Some women who have a history or are at risk for miscarriage or preterm labor are asked to wean by their care provider. However, I have also heard from some moms who have had one or two preterm babies and were still given the okay to nurse during subsequent pregnancies. Second, your nursling will not take the nutrients away from your fetus. Your pregnant body automatically feeds the fetus first, then makes milk for your nursling and then whatever is left goes to you although the system may not work this perfectly. You must eat enough healthy food to be able to feed both of your babies and not develop nutritional deficiencies yourself. I was told I need to be eating about 3,000 to 3,500 calories a day and that should be from healthy foods: lots of protein, healthy fats and green veggies. As for the milk being "bad", breast milk is perfectly safe for your baby when you are pregnant. It does, however, change in composition and taste. At some point towards the end of your pregnancy, your milk will turn into colostrum, causing your baby to, once again, have runny stools like when he was a newborn due to colostrum's laxative properties. This is perfectly normal and safe and is not diarrhea. You may continue to nurse safely during your entire pregnancy and even nurse both children safely once the baby is born. 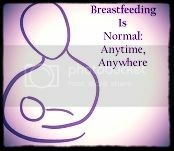 However, your nursling may wean during your pregnancy due to a change in taste or low supply. Some will nurse again once you have more milk and some won't, every baby is different. For me and Daniel, this new pregnancy has presented new breastfeeding challenges. From about 8 weeks or so, I noticed a drop in my supply and Daniel was crying when he tried to nurse and got no milk. it was heartbreaking for me. He was slightly under 9 months at the time and still only having one full solid meal a day which was only about 2-4oz plus snacks throughout the day and was relying mostly on my milk. I called my midwife, who recommended one cup a day of Mother's Milk Tea as well as lots of nettle tea. This helped Daniel stop crying but I seemed to be having off days and good days. I started pumping and was unable to get more than half an ounce. I then started drinking a Spanish drink called malta which is brewed from hops and barley malt, similar to beer but non-alcoholic and sweet. I was also eating oatmeal for breakfast everyday and began drinking Ovaltine. I increased my water intake and focused on eating more calories, especially healthy fats and protein. I saw some improvement but just could not pump more than an ounce and still had some off days. At Daniel's 9 month doctor's appointment, the doctor stated that he was not gaining weight fast enough and I realized he had lost a few ounces. At that point, we decided to focus on feeding him good proteins and fats. We started feeding him a lot of avocado and cheese and finally introduced meat. We also added a second solid meal. Since then, he has greatly increased his solid intake. He now has two huge meals of at least 8-12 oz each plus snacks throughout the day. we will probably be introducing a third solid meal soon as I want to make sure he is getting enough and also want him to get used to three meals a day like the rest of us since he is almost one. At my prenatal appointment this morning, we were happy to discover that he has gained two ounces! I was told to take Life's Basic Plant Protein Plus Greens to increase the fat content and calories in my milk. I am trying but the stuff tastes disgusting and has even made me throw up a few times. Luckily, my midwife said any greens will help and I can take any green supplement I like or even just eat the greens. I plan on making a super soup packed with greens and other veggies and some meat to add protein that both i and Daniel can eat. I also added some Cookies, Then Milk lactation cookies which I will be reviewing on here later this week as well as some special hot cereal and saw an increase. I was then put on antibiotics for a UTI and had a decrease again. I also stayed at my parents house while feeling sick and Daniel started going down for naps with my dad instead of me and he almost didn't nurse at all during the day which I'm sure further decreased my supply.Once I was off antibiotics, I saw a small increase only to get a cold and see a decrease again. I was taking my cookies through all of that and I am glad because Daniel always seemed to be getting enough. The decreases were just in my pumping output which is extra milk anyway. I will be getting more soon to keep up my supply. I am now feeling better but due to unforeseen circumstances, have not been taking any of my galactagogues and have not been able to pump very often. Luckily, Daniel has resumed nursing at nap times and having multiple mini nursing sessions throughout the day. He seems to be getting enough. I consulted with a WIC lactation consultant and she seems to think, based on how much he eats, nurses, pees and poops, that he is getting enough milk but suggested I give him some water with each meal if i am worried about dehydration. He should be able to get whatever nutrition he doesn't receive from my milk, from his solids. For now, he is happy and I plan to start introducing galactagogues one by one back into my diet to hopefully maintain my supply and prevent myself from drying up completely. I don't want to have to take so much stuff so I will take one at a time and eliminate anything that doesn't work or that tastes awful if I can help it. I will continue to pump and store milk to have in case of an emergency or in case my supply eventually tanks. I do plan to tandem nurse and would like to continue nursing Daniel until he is ready to wean (hopefully until at least 2 years old) so I have decided that if it is absolutely necessary to supplement, I will use a supplemental nursing system. However, due to his age and interest in solids, it seems unlikely that I will have to supplement much. We should be able to make it through the pregnancy as long as he doesn't decide he hates the taste of colostrum when it comes in. I will have to come back and update you on the status of our nursing relationship as my pregnancy progresses. As far as the pregnancy goes, everything is going well. I have had some horrible morning sickness and have been very tired and that, along with my cold, have kept me from writing as much as I'd like on here. I had to visit the emergency room last week for some unexplained pain but was assured the baby is okay. We were able to hear the baby's heartbeat at my appointment this morning and it is beating pretty strong. My midwife sent my urine to the lab to re-test for a UTI as that can be the cause of my pain. If not, she thinks it could just be round ligament pain and I will be going to see my chiropractor to see if he can help. I haven't been gaining weight and have actually lost a total of 8 pounds now. My midwife considers this okay for now as long as I gain weight in the upcoming weeks. She suggested I eat more food and said i should eat anytime I'm hungry, even when I wake up hungry in the middle of the night! The greens and soup to increase the fat content of my milk should help me gain weight as well.I will keep you posted on how all three of us are doing as I get further along in the pregnancy. Eating for three is not easy, especially when you have a very active almost 11 month old to chase around all day, but it is something I must do to very well to ensure optimal health for all three of us and proper growth for both of my babies. It is hard work but well worth my time! 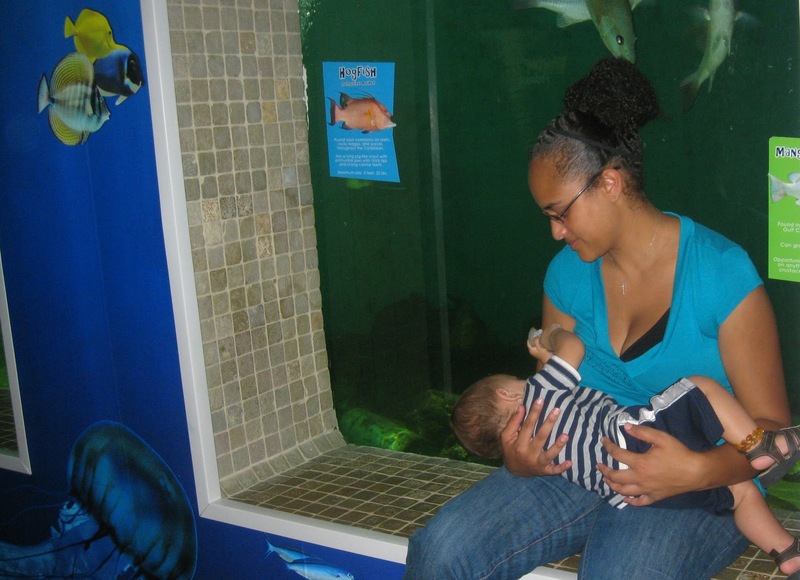 Nursing Daniel at the Clearwater Marine Aquarium a week after I found out I was pregnant (before the milk supply issues began). Thank you for the suggestion Nicole. I actually just stocked up on greens and will be trying different things with them.